CORMETECH designs and manufactures catalysts for coal-fired applications that are designed for long-life and high performance. CORMETECH catalysts are ideal for a variety of coal types that produce a range of flue gas properties, particulate characteristics, and temperatures, including high and low dust applications. CORMETECH's catalyst composition minimizes deactivation caused by poisons, such as arsenic and calcium oxide deposits. Our advanced CORMETECH COMET® catalyst is tailored to oxidize mercury to high levels under challenging conditions involving high temperatures and low HCl concentrations, both of which negatively impact mercury oxidation. The next generation SCR catalyst was developed by CORMETECH to maximize the the conversion of elemental mercury (Hg0) to a water-soluble oxidized (Hg2+) form for subsequent capture via absorption in the downstream wet FGD. Our advanced mercury oxidation catalyst is aimed at allowing coal-fired power plants meet stringent mercury emission standards like the Mercury and Air Toxics Standards (MATS) and limiting the usage of costly Activated Carbon Injection (ACI) solutions. The CORMETECH DUST BUSTER® catalyst consists of optimized channel geometries that facilitate the flow of ash-laden flue gas through catalytic surfaces with high DeNOx activity. This innovative honeycomb catalyst was designed with high dust coal-fired applications that experience high plugging in mind. Our integrated SCR catalyst design and its modular frame construction maximizes NOx reduction and restores balance of plant auxiliary power losses. SO3 mitigation is an important consideration for coal-fired power plants. CORMETECH offers a low SO2 conversion catalyst, which maintains high NOx reduction levels and low ammonia slip. 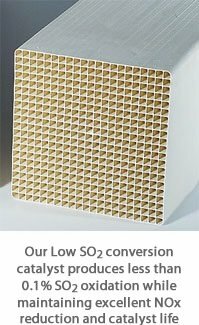 CORMETECH's low SO2 conversion catalyst utilizes its unique extrusion expertise, product and materials know-how, and extensive catalyst technology. Each catalyst is optimized for reduced volume, minimum pressure drop, and low SO2 oxidation.